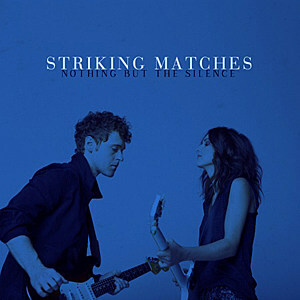 Monday, 23rd March will bring the release of Nothing But The Silence, country duo Striking Matches' debut album. The album features eleven songs and the duo had a hand in writing each of them. Fans of Sarah (Zimmermann) and Justin (Davis) will recognise some of the tracks with the hugely popular When The Right One Comes Along appearing half way through the album and the duo's past single Trouble Is As Trouble Does opening the release amongst others. Throughout listening to the album there were some tracks I found myself drawn to, one of those being What A Broken Heart Feels Like. The drum line gives a strong beat to the track throughout, giving the main lead to the production as well as having the electric guitar included - the guitar being more obvious during the track's softer opening. The lyrics of the track are also very clever, particularly with "everybody knows what a broken heart feels like, everybody says it'll all work out, no-one wants to feel like I do tonight 'cause everyone knows what a broken heart feels like" in the chorus. The overall melody of the track is certainly catchy and I'm sure listeners will be singing along to the chorus very soon after first listening! Miss Me More is another catchy track that won't fail to draw listeners in. With the main melodic lead coming from the mandolin (with another strong drum beat), I'm sure the track will become many listener's favourite. It also feels as though Sarah and Justin really enjoyed recording it, the duo seem really comfortable throughout the recording. I'm sure this is a great track to hear live with it's playful, gutsy feel. There were two tracks in particular that really stood out for me, one of which being Like Lovers. The simplicity of the production leaves space for the duo's vocals to really shine and both deliver an emotive, heartfelt performance. Sarah and Justin both have quite different tones but their voices blend really well and, whilst the duo are undoubtedly very talented guitarists, it is really nice to hear their great vocals given chance to shine as well. The closing track, God And You, is the absolute gem in my opinion. Justin takes the lead and delivers an amazing vocal that just oozes emotion and Sarah's backing vocals are delicate and a perfect addition. As a listener you can really feel yourself just carried along by the track and I am sure a lot of people will find it is over before they know it. Written by Sarah, Justin and Rivers Rutherford, all three should certainly be commended on gorgeous lyrics such as "there's a wall around the soft spot of my soul, where I don't let too many people go, in fact the only ones who've ever broken through are God and you". You're set to release your debut album, did you find it all came together easily? Well, we've been a band for about 6 years, so we have absolutely learned the definition of "patience". The only thing that has really come quickly was the recording of the album, which took about 5 days. Nothing else has gone all that fast, but we wouldn't have had it any other way. Turns out timing is everything! Which is your favourite song from the release? Justin - Make a Liar Out of Me. I love that we kept in the guitar solo at the end, and I just remember everybody sitting back and laughing when we finished it because Sarah totally nailed it. Sarah - Mine would have to be Never Gonna Love Again. It took such a huge journey from the demo to the record version, and I just love where it went. I wrote a lot of it in my car on my way to my mum's on my phone so the journey it took from there was pretty cool to hear, having not really played it much live to what we were able to do with it in the studio with just 4 instruments. What was the hardest track to write on your new album? Nothing But The Silence was an idea that Justin had and wrestled with for about 6 months before it finally came together in a writing session with Bonnie Baker. Once we were in the room, it took shape in about 4 hours, but leading up to that was hard! It's great to see you are set to return to the UK for a short tour, do you plan to make it a regular thing? Where would you like to see your career take you ultimately? The sky's the limit, honestly. We definitely hope to be making records and playing shows for a long long time!! What venue would you most like to play at that you haven't already? We are dying to play Royal Albert Hall. Someday! You are on a lot of 'Artist to Watch' lists for this year - including mine! - do you feel that inspires you to keep working? Absolutely. It's an honour to be thought of as an Artist to Watch, and you definitely want to give people a reason to watch and keep watching. And we want to make good on the folks who have stuck their necks out and believed in us! Nothing But The Silence has a great blend of tracks on it, with quite a few blues influenced songs. There is a 'rootsy' sound prevalent which, in my opinion, would see the duo sitting more comfortably into Americana rather than the country-rock they have been mostly described as. I would definitely recommend purchasing this, I said at the end of the last year the duo would be one to watch during this year and this album really cements that and is a credit to them. Striking Matches will return to the UK for three shows this May after a hugely successful performance at this year's Country To Country Festival - tour dates can be found on their website here.